Understanding keywords function is very important if you want to obtain higher conversion for your online business. How often do you come across a tool that can show you which keywords to use? There are plenty of them out there actually. 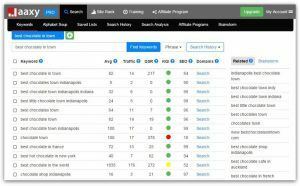 So, what exactly makes Jaaxy the best keyword research tool? Let’s find out. When the creators of Wealthy Affiliate started their online career about a decade ago, they were frustrated to find that most keyword tools do not produce real information needed for marketing analysis. In other words, online marketers are not getting reliable results to successfully promote their web business. They began engineering for a better way to gather these data and in 2010, Jaaxy was launched. Since then, many online marketers have learned to make better sense of keywords and to use them appropriately to grow their web business. On October 2014, Jaaxy 2.0 was rolled out to deliver data more efficiently than before. Here’s what you need to know about this robust interface. The main feature of Jaaxy is to do keyword research. For beginners, it is recommended that you start searching for ideas before plunging into the research process. One efficient way to do this is by using Alphabet Soup Technique (AST). This method works by default in all the search engines, but you’ll have to do it separately in different windows. Jaaxy has engineered its database in such a way that when you do an AST, the proceeded and preceded alphabets on that search term are compiled in a list for easy viewing of your ideas and revealing keywords. A valuable keyword is one that reveals low competition so that it has more opportunity to rank higher in search engine results page. You can always begin with a broad term and gradually narrowing down to more specific terms, also known as long tail key words. Average – the number of searches that the keyword receives in a month. Traffic – the number of visits to your website if you are found on the first page of search engines. Quoted Search Results (QSR) – the number of competing websites ranked in Google for this exact keyword. Domains – the availability of domains on that keyword. And that’s it! All the keyword information is being analyzed for you in a single click and the ‘raw data’ that you are getting in Jaaxy is as good as it gets. All the data are stored in the search history, they can be organized into specific lists and easily edited when necessary. Most people who start with an online business struggle to find a niche. Everybody wants a business that can profit, but to do that, we must first know which niche is in demand, right? Whether you are looking for a new niche or branching out from your existing niche, Jaaxy is an excellent tool for that. With the brainstorm feature, you can key in a broad (niche) idea and see what’s trending in Google or Yahoo in real-time. Each broad term can then be refined with the keyword research to narrow down the niche with more specific terms. By selecting keywords that make sense with high searches and low competitions, you’ll be able to choose a profitable niche. Often times, you could also be looking for a domain to go along with your new niche. If you are interested in keyword rich domain, Jaaxy offers instant domain availability (.com, .net, .org) right next to every listed keywords. This will save you tonnes of time without having to do it manually on the domain provider site. One of the main purposes of having a website is to know how good your content is ranking in search engines. If your site is constantly buried within millions of other search results, no one is going to read your web pages and worse, no one is going to know about your web business at all. Jaaxy provides a site rank feature that allows you to analyze your site ranking (or that of your competitors) from an anonymous point of view. In other words, it will not track the search history from the browser that you are using and the result that you are getting is almost 99.9% accurate in real-time search. In reality, you should perform this type of search regularly so that you will know if your SEO efforts are paying off and what you can do to rectify if your pages are not ranking well. The breakdown of a site analysis is shown in the image below. On the other hand, the search analysis feature allows you to dissect ‘what’s inside’ the top 10 results of a targeted keyword in Google, Yahoo and Bing. It provides details such as meta title, URL and meta description of that particular site. This is a great way (and completely legal) to gain insights to your competitor’s websites, find out why they rank so well and how you can use this information to improve on your ranking. Another great feature worth mentioning in Jaaxy is its ability to search for affiliate programs that are related to your niche. So instead of searching manually within each affiliate network, you’ll just need to plug a targeted keyword and you’ll get a list of affiliate programs as shown in this image. Depending on what niche you are interested in, there are thousands of affiliate programs that want you to promote their online brands. I don’t know about you, but that sounds like a lot of great business opportunities up for grab. It’s free to sign up (limited to 30 searches only) when you use Jaaxy for the first time. 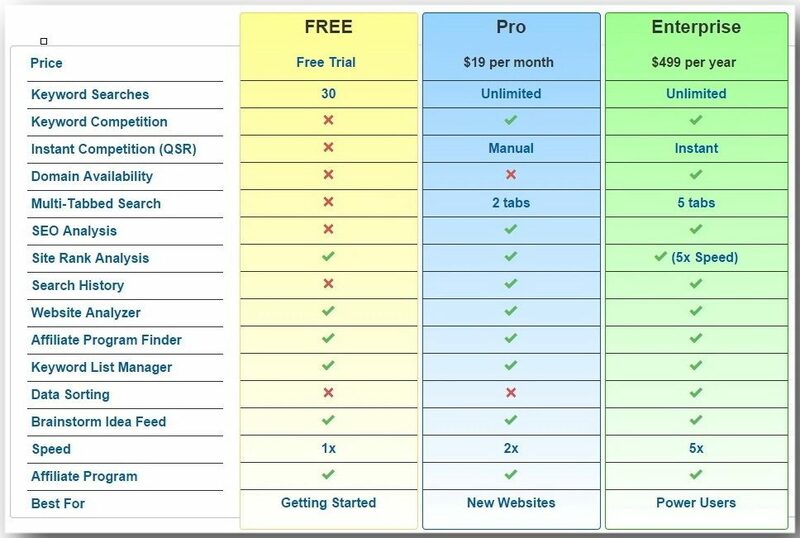 These are the difference between the free and paid membership subscriptions. Firstly, if you are the type of person who likes simplicity like me, you’ll be very pleased to find that Jaaxy’s interface is non-cluttering and easy to navigate. There are no graphs or charts trying to ‘inflate’ your understanding about keywords and the only thing that you need to focus on is the keyword metrics. When compared to other keyword research tools, it provides straightforward data. And great for sales conversion. So, Is Jaaxy Worthy of Your Time? It takes a bit of a learning curve to understand what keyword research is all about especially when you are venturing into online marketing for the first time. Jaaxy’s goal is to help you simplify things and to speed up the market research process so that you only need important results to go ahead with building your business. Simply enter a keyword below to try it out for yourself. If you need any help with keyword research, connect with me at this awesome training platform and I’ll walk you through the process step-by-step. See you there. “Knowing the competition that a keyword has in the search engines is the single most valuable piece of data that you can have.” -Kyle, co-founder of Jaaxy. Have you used Jaaxy or other keyword tools before? How has it influence the way you research for keywords and the growth of your online business? Please share your experience with us. Tons of great information on Jaaxy, Cathy! It certainly is the best keyword tool out there in my opinion. It’s not only a keyword tool, but so much more with all the extra features that are available to use. Very informative post, it has reminded me of all the once time consuming tasks that can be taken care of in a matter of minutes using Jaaxy. Indeed, Jaaxy is very easy to use. When I first learned about keyword research, I thought I had to analyze data and interpret graphs. But as it turns out, Jaaxy generates data in just a few clicks. I personally like using it to brainstorm for long tail keywords. I use Jaaxy Pro too. It is awesome Has greatly increased my online income and is now as necessary for me as oxygen. 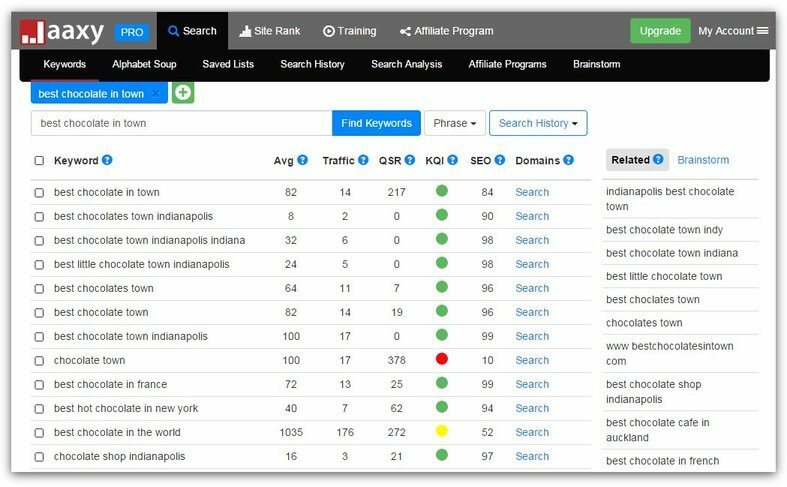 I had great difficulty getting ranked with the free keyword tools as some of the data was out of date. But I now consistently get top google rankings simply because I am working with the most up to date data available.